In the 10 years since its inception, The Montreal Drum Festival has grown to become one of the world's pre-eminent percussion events. 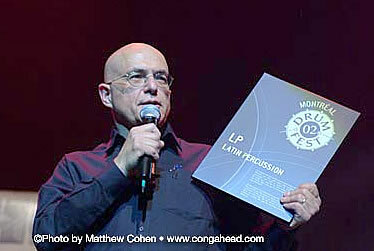 This year event organizer Ralph Angelillo presented me with a plaque commemorating Latin Percussion's steadfast support of the yearly event since its humble beginnings 10 years ago. It was certainly a great honor and privilege to be thanked in such a way. LP artists were, as usual, a highlight of the event. Crowd favorites Raul Rekow and Karl Perazzo of the Santana band, delivered an electrifying performance. LP artist Walfredo Reyes Jr. flew in from Scotland where he was recording with Steve Winwood to give the event goers an awe-inspiring display of percussion skill. Rising star Tony Royster Jr. proved that he is a very accomplished drummer with a killer sense of groove.